The coupe and 5-door Mercedes-AMG GT falls in line with the version 43 which does not offer that… 367 ch. 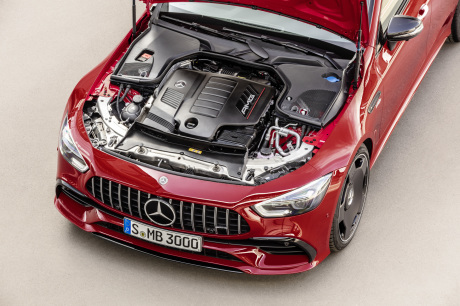 367 hp under the hood, The Mercedes-AMG GT 43 has a six-cylinder engine line 367 hp and 500 Nm. 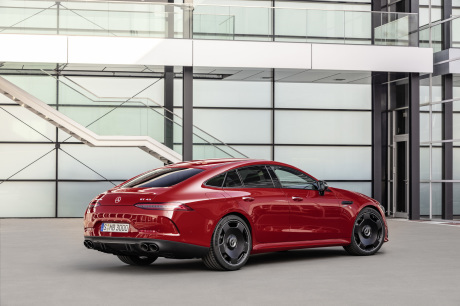 In order to democratize the offer and answer to the competition : the Audi A7 Sportback and Porsche Panamera, including the versions of entry-level offer, respectively, 340 and 330 horsepower, the Mercedes-AMG GT will have a version 43 high of 367 hp and 500 Nm. It is the same block six-cylinder engine than the 53 incorporating an electric motor that adds 22 kW (about 16 hp) and 250 Nm of torque. The Mercedes-AMG GT features a digital dashboard. This architecture, called the 48V provides additional power via the effect of a booster and also allows the recovery of braking energy. Mercedes announces a 0 to 100 km/h in 4.9 s and a top speed of 270 km/h. This declination has been approved for a fuel consumption of 9.1 l/100 km in the combined cycle and CO2 emissions of 209 g/km. Prices Mercedes-AMG GT 43 Note the particular shape of the rims … to say the least, massive. As for the other models of the range GT coupe 5-doors, this variant 43 is equipped with the 4Matic all-wheel drive and an automatic gearbox 9 reports 9G-Tronic. The price of the Mercedes-AMG GT 43 will be 95 259,50 € on the German market.